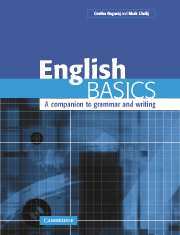 These books are especially useful for students taking written exams and anyone who needs to write well in English. Grammar Builder takes a simple but effective three-step approach (error identification, correction and practice) to help learners master English grammar. Real examples of correct usage and common mistakes made by learners introduce grammar items in each unit and show learners how subtle differences can result in grammatical errors.